htop is a Linux process monitoring tool, It is an alternative tool for top command, Which is the standard and the default process Monitoring tool in Linux and Unix Operating System. 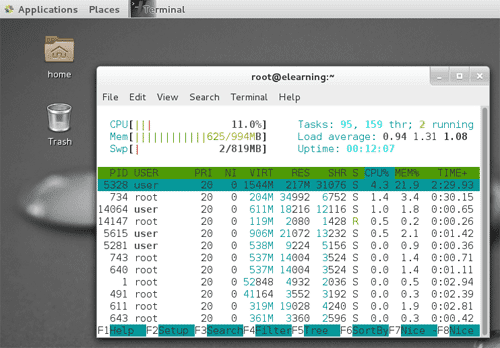 But htop on CentOS 7 is more user friendly and output is easy to read compared to the Linux top command. In this Tutorial We are going to learn how to Install htop on CentOS 7 using yum install command with epel repository. First, enable the epel release on CentOS 7. Now we can install CentOS htop using yum install command. You can see the output of the htop process monitoring tools is more readable and easy understand. In this tutorial we installed htop on Linux CentOS 7 using epel repository. First, we enable the epel-release and then install htop using yum command (Without epel-release you will receive the following error "No package htop available"). We can also use this same method to install htop on CentOS 6.5 and older versions.